MARIJUANA BLOGS & RESEARCH: Beginner’s Guide to Growing Marijuana! This is a guide that I pulled off the net that puts everything in plain and simple English, and doesn’t go to deep into advanced botany and gardening. I find this one to be the best guide out there. Growing marijuana indoors is fast becoming an American Pastime. The reasons are varied. With the increased interest and experimentation in houseplant cultivation, it was inevitable that people would apply their knowledge of plant care to growing marijuana. Many of those who occasionally like to light up a joint may find it difficult to locate a source or are hesitant to deal with a perhaps unsavory element of society in procuring their grass. There is, of course, the criminal aspect of buying or selling grass; Growing marijuana is just as illegal as buying, selling, or smoking it, but growing is something you can do in the privacy of your own home without having to deal with someone you don’t know or trust. The best reason for growing your own is the enjoyment you will get out of watching those tiny little seeds you picked out of you stash sprout and become some of the most lovely and lush of all house plants. 1. Get the seeds. If you don’t already have some, you can ask your friends to save you seeds out of any good grass they may come across. You’ll find that lots of people already have a seed collection of some sort and are willing to part with a few prime seeds in exchange for some of the finished product. 3. Plant the sprouts. As soon as the seed cracks open and begin to sprout, place it on some moist soil and sprinkle a little soil over the top of it. 4. Supply the plants with light. Fluorescent lights are the best. Hang the lights with two inches of the soil and after the plants appear above the ground, continue to keep the lights with two inches of the plants. It is as easy as that. If you follow those four steps you will grow a marijuana plant. To ensure prime quality and the highest yield in the shortest time period, however, a few details are necessary. oven for about an hour at 250 degrees. Be sure to moisten it thoroughly first and also prepare yourself for a rapid evacuation of your kitchen because that hot soil is going to stink. Now add to the mixture about one tablespoon of fertilizer (like Rapid-Gro) per gallon of soil and blend it in thoroughly. Better yet, just skip the whole process and spend a couple bucks on some soil. container you use should be no larger than six inches in diameter and can be made of clay or plastic. To transplant, simply prepare the larger pot by filling it with soil and scooping out a little hole about the size of the smaller pot that the plant is in. Turn the plant upside down, pot and all, and tap the rim of the pot sharply on a counter or the edge of the sink. The soil and root ball should come out of the pot cleanly with the soil retaining the shape of the pot and with no disturbances to the root ball. Another method that can bypass the transplanting problem is using a Jiffy-Pot. Jiffy pots are made of compressed peat moss and can be planted right into moist soil where they decompose and allow the passage of the root system through their walls. The second container should have a volume of at least three gallons. Marijuana doesn’t like to have its roots bound or cramped for space, so always be sure that the container you use will be deep enough for your plant’s root system. It is very difficult to transplant a five-foot marijuana tree, so plan ahead. It is going to get bigger. The small plants should be ready to transplant into their permanent homes in about two weeks. Keep a close watch on them after the first week or so and avoid root binding at all costs since the plants never seem to do as well once they have been stunted by the cramping of their roots. mixture directly onto the foliage. The leaves absorb the fertilizer into their veins. If you want to continue to put fertilizer into the soil as well as leaf feeding, be sure not to overdose your plants. worm castings. These castings are so rich that you can grow marijuana in straight worm castings. This isn’t really necessary however, and it is somewhat impractical since the castings are very expensive. If you can afford them you can, however, blend them in with your soil and they will make a very good organic fertilizer. ensure that the amount of light received each day remains constant. A “vacation” timer, normally used to make it look like you are home while you are away, works nicely and can be found at most hardware or discount stores. The ideal temperature for the light hours is 68 to 78 degrees Fahrenheit and for the dark hours there should be about a 15-degree drop in temperature. The growing room should be relatively dry if possible. What you want is a resinous coating on the leaves and to get the plant to do this, you must convince it that it needs the resinous coating on its leaves to protect itself from drying out. In an extremely humid room, the plants develop wide leaves and do not produce as much resin. You must take care not to let the temperature in a dry room become too hot, however, since the plant cannot assimilate water fast enough through its roots and its foliage will begin to brown out. and resin instead of stems. can drown your plant just as easily as you can let it get too dry and it is more likely to survive a dry spell than it is to survive a torrential flood. Water the plants well when you water and don’t water them at all when they don’t need it. into lather. Then put the suds over the plant. The obvious disadvantage is it you don’t rinse the soap off the plant you’ll taste the soap when you smoke the leaves. We have found that pruning is not always necessary. The reason one does it in the first place is to encourage secondary growth and to allow light to reach the immature leaves. Some strands of grass just naturally grow thick and bushy and if they are not clipped the sap moves in an uninterrupted flow right to the top of the plant where it produces flowers that are thick with resin. On the other hand, if your plants appear tall and spindly for their age at three weeks, they probably require a little trimming to ensure a nice full leafy plant. At three weeks of age your plant should have at least two sets of branches or four leaf clusters and a top. To prune the plant, simply slice the top off just about the place where two branches oppose each other. Use a razor blade in a straight cut. If you want to, you can root the top in some water and when the roots appear, plant the top in moist soil and it should grow into another plant. If you are going to root the top you should cut the end again, this time with a diagonal cut so as to expose more surface to the water or rooting solution. The advantage to taking cuttings from your plant is that it produces more tops. The tops have the resin, and that’s the name of the game. Every time you cut off a top, the plant seeds out two more top branches at the base of the existing branches. Pruning also encourages the branches underneath to grow faster than they normally would without the top having been cut. smelling them and if you smell an acrid aroma take the weed out of the jar and spread it out on newspaper so that it can dry quickly. Another method is to uproot the plants and hang them upside down. You get some burlap bags damp and slip them up over the plants. Keep the bags damp and leave them in the sun for at least a week. 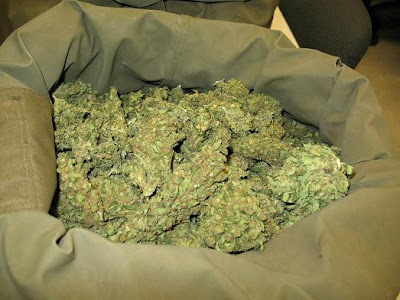 Now put the plants in a paper bag for a few days until the weed is dry enough to smoke. Like many fine things in life, marijuana mellows out with age. The aging process tends to remove the chlorophyll taste. credit card, every last bit of information regarding that purchase is filed away into a database, both at the store and with your credit card company. Not only the price, but the exact date, location, and items purchased are recorded and stored away. Many stores and credit card companies routinely sell their databases of customers and transactions to anybody who can afford it. The D.E.A can certainly afford it. After all, they’re using your tax dollars. The D.E.A. of junk mail and a lot of people knowing exactly what you buy and when you buy it.